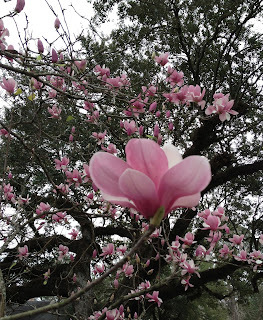 Yesterday, I heard from many readers who enjoyed the essay on the Japanese magnolia tree, a tree that brightens the late winter landscape and heralds the beginning of spring in south Louisiana. Today, I thought I’d do a counterpoint feature on one of the Deep South’s not-so-well-received plants – the noxious water hyacinth. Boaters and fishermen in south Louisiana often encounter and utter a few expletives about the exotic water hyacinth, so aptly described in Dr. Victoria I. Sullivan’s new nature guide, Why Water Plants Don’t Drown. 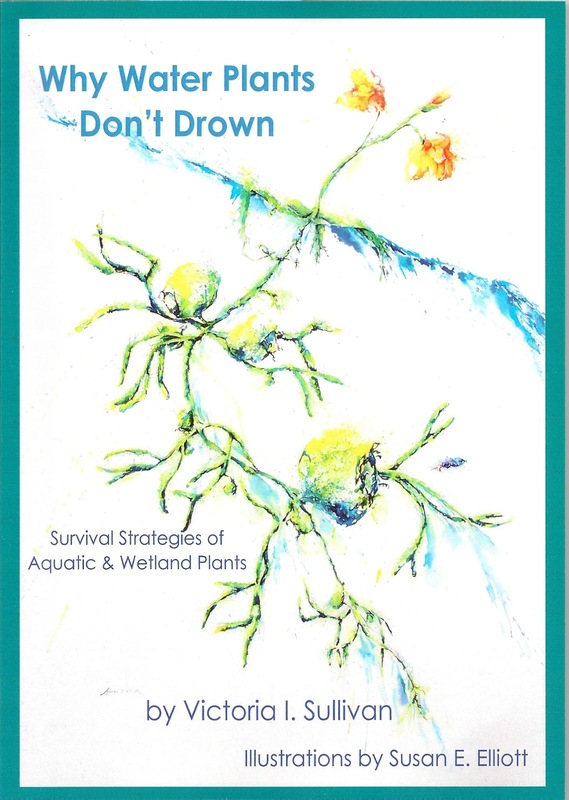 This book covers the survival strategies of aquatic and wetland plants and includes a beautiful illustration of the prolific water hyacinth, the bane of Louisiana boaters. According to Sullivan, the water hyacinth was introduced at the International Cotton Exposition in New Orleans, Louisiana in 1884 when visiting members of the Japanese government distributed souvenir water hyacinth plants from Venezuela. Those who received the beautiful flowering plants with their purple-petaled blooms and yellow bull’s eye nectar guides regarded them as treasures and transferred the plants to garden and farm ponds near New Orleans. Of course, they quickly multiplied, and people began to dispose of them in the nearest lakes and rivers to get rid of them. It seems that water hyacinth can form mats that double in size within a few days, and the leaf blades of the plant catch the wind like sails, moving them over the water. The rafts of plants can become entangled in boat propellers and stall the boats of fishermen. State and federal governments in southeastern states budget billions of dollars annually to deter the spread of water hyacinth. The rafts of the plant are large and thick, and deprive photosynthetic organisms under them of light, thus reducing their oxygen production. 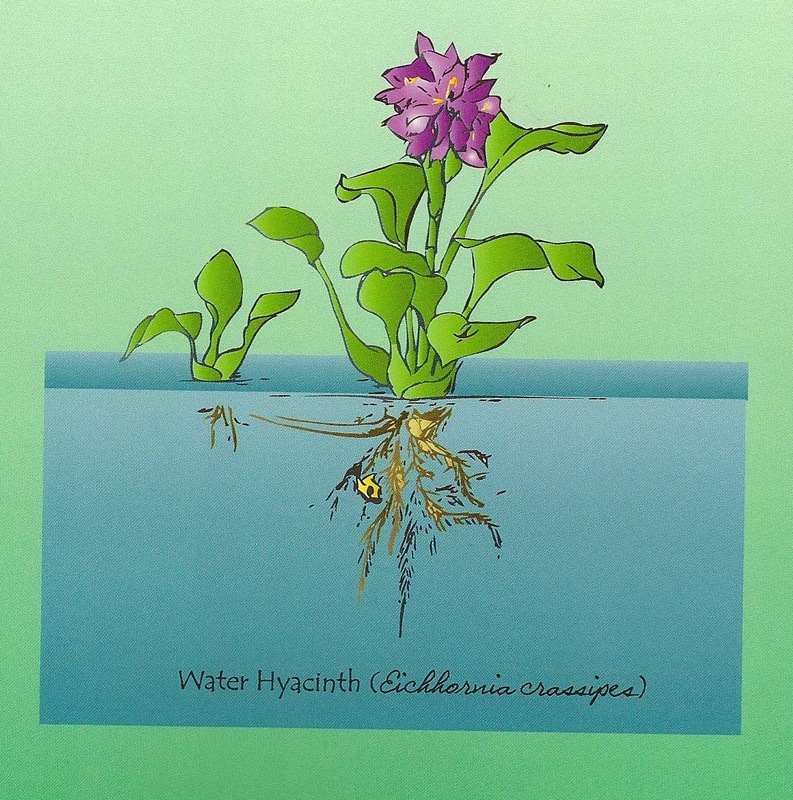 But water hyacinth release oxygen into the water through their roots. Boaters and fishermen may regard the water hyacinth as a nuisance, but this exotic plant does benefit other plants and animals. Seeds of the water-spider orchid and water primrose germinate and grow on the large, thick mats of water hyacinth, and the feathery roots of the plant form habitats for small animals. In addition to these benefits, water hyacinth help clean water that has become polluted by household waste and fertilizer run-off. 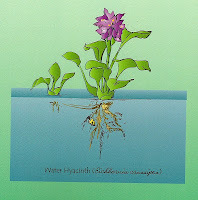 This feature about the water hyacinth is included in a section entitled “Floaters” in Why Water Plants Don’t Drown, which features plants that float on the surface of the water and have roots that hang freely in the water. 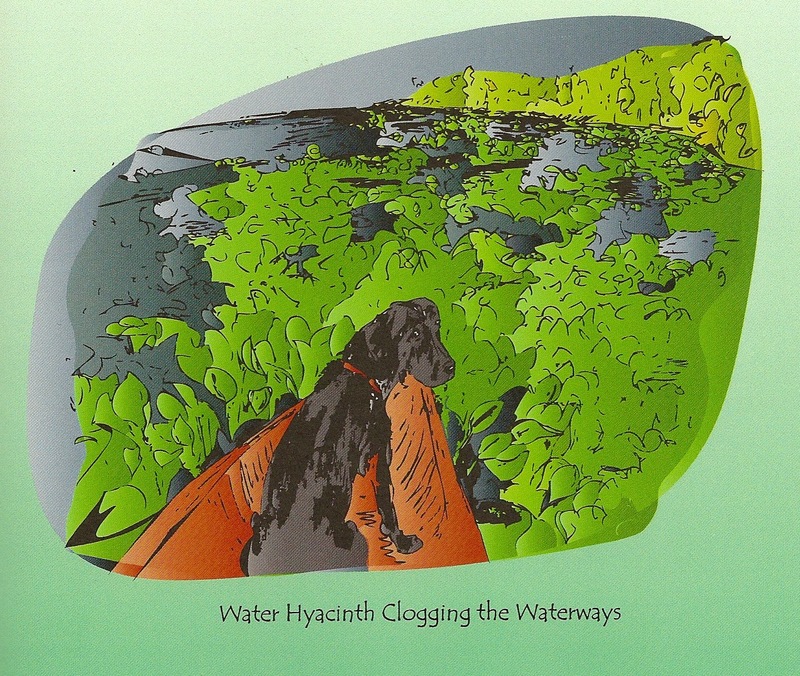 The two arresting illustrations in this blog were rendered by Susan Elliott, an artist, ecologist, and writer who lives in Montrose, Colorado – Elliott illustrated Why Water Plants Don’t Drown and note cards featuring some of the plants contained in this nature guide. 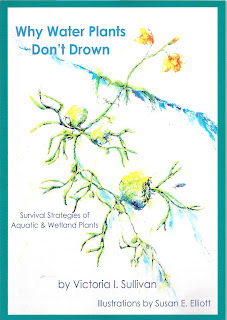 Copies of Why Water Plants Don’t Drown and packages of cards featuring some of the plants can be ordered from Pinyon Publishing either online or by mail at 23847 V66 Trail, Montrose, CO 81403. A sight that inspires us to believe “if winter comes, spring can’t be far behind” is that of a Japanese magnolia tree in bloom. Here in the South, the blossoms signal the end of winter and hint at an early spring. The blooming tree also tells us that azalea, dogwood, and redbud blooms aren’t far behind. A tree touted to be the oldest tree known to man – 50 million years old – the Japanese magnolia was introduced to English speaking countries by the Japanese, but it’s actually native to southwest China. The beautiful tree has large, tulip-shaped, purple, pink, and sometimes white flowers that need feeding in late winter. (My backyard tree must have starved at some time or another, or was killed off by frost because it is sans blooms; however, others in the neighborhood are heavy with blossoms). 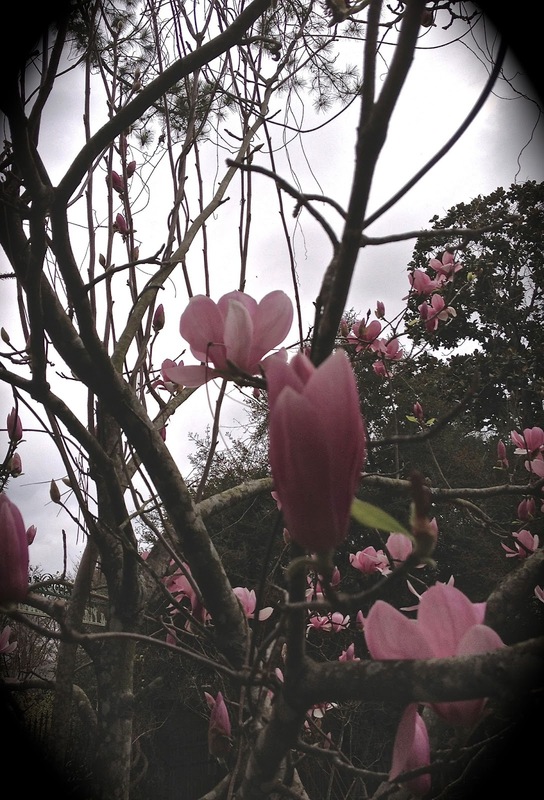 Some varieties of the Japanese Magnolia, like Verbanica, with its light purple blooms, show good frost tolerance during the time of blooming. The tree loves early morning because at that time the sun’s beams aren’t as strong as those during the afternoon, and the goblet-shaped blooms almost seem to be cupping the soft light to greet the day. I’ve searched through many plant books and journals, looking for information about how the Japanese magnolia trees got across the pond and introduced into our yards and gardens but haven’t turned up any data yet. I’ve even searched through Haiku poetry volumes, hoping to find an appropriate Haiku about the fragrant, stunning blooms of this tree and find numerous mentions about the plum tree, but no reference to the lavender/purple blooms of the tree that we call Japanese or Saucer magnolia. Most Haiku focuses on a landscape or scene that can be interpreted in many ways, so this Haiku poem by Bundo could be attributed to our southern Japanese magnolia: “A heavy cloud hangs low – /a cloud of blossoms o’er the land, /Pink, like the sunrise glow.” (In my lexicon of definitions, I often refer to this kind of poetry as “snippets”). P.S. If you have a digestive problem, the bark of the Japanese magnolia tree has been used to treat this malady. My own treatment for a case of dyspepsia: stand and look at a Japanese magnolia tree in bloom for thirty minutes daily. At a recent poetry reading, “A Midwinter Night Poetry Reading” at A and E Gallery here in New Iberia, where I read alongside Julie Kane, Louisiana Poet Laureate and Lafayette poet Clare Martin, I met several new writers and editors who are promoting creative writing in the area. One of them, Jonathan Penton, is a poet and editor of “Unlikely Stories, Episode IV” an online literary journal and a coordinator of Acadiana Wordlab, “an uncensored weekly writing workshop” in Lafayette, Louisiana. I sat across from Jonathan at the dinner following the reading and was briefly introduced to the idea of Jonathan’s weekly literary drafting workshop in Lafayette. I had no idea that I was being “auditioned,” for lack of a better word, but yesterday I received a message from Jonathan inviting me to be a February presenter at the Wordlab. The Lab requires no formal membership and serves as a space where people can gather every Saturday from 2 p.m. to 4 p.m. to work on their writing craft at Cite’ des Arts in Lafayette. It focuses on art as a writing prompt, but the prompts aren’t confined to literary art – visual artists, filmmakers, and musicians have contributed to the work of the Lab. The relaxing component of the Acadiana Wordlab is that it’s a drafting workshop, rather than a critique workshop. A presenter features a work of art, a lecture on the craft, or a discussion of art and then asks participants to respond by writing for twenty minutes or more. After writing, the participants read their creations aloud, and if time permits, the presenter makes a second prompt, followed by more writing and reading aloud. I understand the process because about fifteen years ago, I formed and coordinated a writing group called “The Reflections,” an adult education class at the Episcopal Church of the Epiphany in New Iberia, Louisiana. At meetings in the “Upper Room” of the parish hall, I’d present a short lecture on a spiritual book, request members of the group to respond for twenty minutes, then to read their “reflections.” The results were amazing – illuminating quick sketches that I called the “feminine face of God” – spontaneous, poignant, strong and nurturing responses written in the spirit of both pathos and humor, which reflected the essence of the female soul. 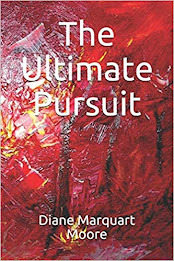 As I wrote in the chapbook, Meditations of My Heart, that we later produced, “they educated my own heart and enriched my spiritual journey.” Other members of the group said that the experience engendered the same responses in them. Four members of the Reflections group of twelve participants went on to become authors of books: Margaret Simon, author of the young adult book, Blessen; Dr. Victoria Sullivan, author of the speculative fiction, Adoption and of the nature guide, Why Water Plants Don’t Drown; Mary Wyche Estes, author of Mending of the Heart and of Bass Reeves, Deputy U.S. Marshal, 1875-1902; and Janet Faulk, author of Road Home, a collection of essays about growing up “southern.” One “Reflections “songstress has become an outstanding voice in the music group, “Blue Merlot,” and co-wrote, with Grammy Award winner “Bubba” Murrell, the lyrics and music for the recording “Women at the Well.” Folk artist Jean Wattigny continued her work as an artist of whimsical paintings for which she has gained regional recognition. I might add that my own writing catapulted ahead light years following this two-year experiment in prompting the Muse! 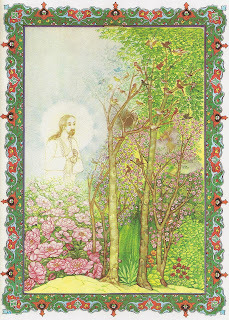 Cover drawing of Meditations of My Heart by Paul Schexnayder, renowned New Iberia artist. Saturday evening at a poetry reading honoring Julie Kane, the Poet Laureate of Louisiana here at A and E Gallery in New Iberia, I was privileged to read alongside Julie and Clare Martin, a Lafayette poet who read from her recent book, Eating the Heart First. It was a fun night, and each of us had our moment reading our own brand of wry verse. One of the poems I read was about the advent of the robotic era, and this morning, my friend, Dr. Victoria Sullivan, who writes speculative fiction, began telling me about a science fiction novel she’s reading entitled The Night Sessions (Ken Macleod) in which all the characters have personal robots that follow them around. The creatures are databases with telescoping legs so that they can get shorter or taller, and they talk, analyze, and evaluate what is going on around them, arguing if necessary (in this novel, to assist in solving a mystery). As I told my audience Saturday, I have one robot I wrote about in an earlier blog – a round, flying saucer-shaped object that responds to my pushing a large button in the middle of her belly and whom I call “Sweet Feet” because she doesn't talk back when I ask her to clean floors. In fact, she’s busy at the moment, and her quiet industriousness inspired me to write about the virtues of robots this morning. She does have a voracious appetite, often swallowing the fringes on rugs in the house, but my immediate surgical extractions result in her being up and doing in remarkable recovery time, within moments. Some of the more interesting robots are the personal care creatures that are being used for the care of autistic children. It seems that since the robots have no expression on their faces and are less intimidating than humans, the autistic children respond more rapidly to teachings about how to respond to humans. Also, the Japanese, who have a burgeoning elderly population, are doing extensive research on robotic creatures because of the growing need for personal care of old people. In the field of mining, robots are being used to automate the most dangerous, costly, and difficult mining jobs, which results in higher efficiency and productivity in American operations. Robots allow the miners to negotiate hard-to-reach deposits and to extract the minerals more economically than existing extraction methods. There are more entries online about robots than you can shake a stick at, including reviews of “The Robots,” a movie made in 2005 that features these mechanical creatures. The star of "The Robots" is a young inventor who creates a “Wonderbot” because he wants to make the world a better place for everyone and who tries to keep older robots from the Chop Shop where they’ll be shredded and melted down. The characters have mechanical names like “Ratchet,” “Gasket,” “Big Weld,” etc. 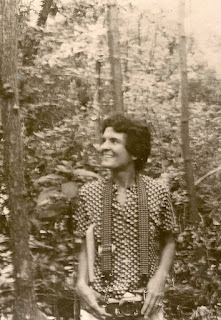 The plant hunter on an early expedition. This week’s “monsoon” that flooded city streets throughout Acadiana reminded me of Hurricane Elena and an article I wrote back in 1988 about a plant collecting trip in which I accompanied my friend Dr. Sullivan and a Japanese botanist, Dr. Yahara, to St. Augustine, Florida. On that memorable trip, Hurricane Elena followed us 700 miles to Florida, then turned and followed us all the way back to the Gulf Coast after we had collected the plants. We were searching for Eupatorium, weeds with dirty white flowers that most people would scarcely glance at a first time, much less a second time, identifiable in ditches, pastures, and at forest edges by the botanists from a van speeding 65 mph along interstate highways. The botanists were collecting samples of these plants to analyze the isozymes and chromosome karyotypes for comparison of species with those in East Asia. So much for scientific explanations. The memorable part of the trip was the behavior of these botanists. During the three-day trip, rain fell in buckets, as the hurricane began to shadow us. To ward off the rain, Dr. Yahara tied a light chartreuse towel around his shaggy, home-barbered style hair, but Dr. Sullivan ran bareheaded through the drops, and I foolishly followed them on this plant hunt. We waded through palmetto, swamp magnolia, large colonies of mosquitoes breeding in the hardwood forests, and stretches of posted property (I’ve never hunted plants with a botanist on anything but posted land – botanists are drawn to growth on illegal property as irresistibly as insects to pitcher plants). Somewhere along the way, Dr. Sullivan allowed Dr. Yahara to drive because he wanted to practice his driving, he said. Now, in Japan, drivers motor along, British style, on the left-hand side of the road, and the steering wheel is located on the right-hand side of the vehicles. Add to this disadvantage of everything being backward Dr. Yahara’s unfamiliarity with power steering and brakes and you get the picture – that of a gleaming white van moving in fits and starts in the fast lane of a major U.S. artery. 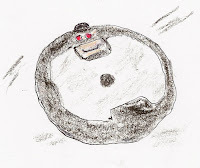 The sudden bucking halts caused a stream of piggybacking vehicles behind us, and curses were hurled at our pilot in a maelstrom of ethnic prejudice. While the botanists ran through the rain, much of the time I stayed in the backseat of the van where I sat, recording the botanist’s antics and where space requirements had been violated by large white plastic bags of specimens. The van also developed an odor, an odor which grew stronger by the moment – the botanists had packed the sulphurous smell of a nearby paper mill within the bags! Flies had also found a landing strip in the back of the van where I had been placed in this inferior unscientific position. 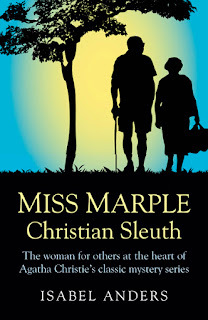 Rain fell in heavy gray sheets while we stopped and started, the scientists experiencing botanical seizures when they came upon such places as an airstrip surrounded by a high wire fence with a sharp pointed strand of barbed wire along the top. Eupatorium recurvans species lay just beyond, beckoning the duet. Dr. Sullivan halted the van, and the couple got out to stand before the fence, peering at the species longingly before deciding not to muster the climb. They seemed very compatible, standing there in the rain, wistfully contemplating a population of weeds in a field inaccessible to poor botanists. Dr. Yahara would have scaled the barrier if Dr. Sullivan hadn’t restrained him because of possible plane landings, she said, which, of course wasn't a rational explanation in the face of Elena’s threat and no planes landing. Meanwhile, the leading edge of Hurricane Elena had swamped coastal areas with high tides, thunderous surf, and torrential rain. The storm, its winds roaring at 100 miles per hour, veered toward northeast Florida where we were headed. Rain had fallen so heavily in Apalachicola at midday that visibility had been only 20 feet, but we traveled on. I was beginning to have problems breathing in the space trespassed by all the severed plants in the bags. At dusk, the botanists decided to stop at a motel in St. Augustine to wash the root stocks so that Dr. Yahara could send them back to Japan. They discovered a garden hose lying outside the motel office door, quickly filching it and attaching it to a spigot outside the motel room before they began their Saturday night washing. By midnight, the pair had laundered one fourth of their harvest … and Elena had stalled in the Gulf of Mexico somewhere west of Cedar Key. We tried to outrun the hurricane on the 14-hour trip home and got off route, moving toward Ocala on a direct southwesterly line to Cedar Key. I hissed at the botanists that we were heading into the path of Elena and a swarm of tornadoes. Trees bowed and curtsied to us in the gusts that had begun to rock the van. Rain slashed heavily against the windshield, chasing us back on route. A wind shear stalled the hurricane’s strengthening, and we crossed over to Highway 441, passing within five miles of Marjorie Kinnan Rawlings' home where The Yearling had been written. Such are the memories inspired by two days of forced isolation during a heavy rainstorm in south Louisiana! I hasten to add that this past year Dr. Sullivan was honored for her work with Eupatorium by having Eupatorium sullivaniae named for her. After writing 495 blogs, it’s hard to discern whether I repeat myself, but when I have a passion for a certain subject, I’m likely to cover the same tracks again – writings about trains, for instance. However, I usually present a different destination for that subject, often in a poem that better captures the essence of this mode of transportation. At Christmas, I brought my only electric train out of the hall closet, a gear-driven, powerful Diesel locomotive, complete with light, HO scale freight cars, and a 36” circle of track-- the locomotive is a model advertising my favorite railway, the Santa Fe Railway. I brought the train out for Alex, my great-grandson, to watch. However, it was soon apparent that a nearly-two-year old boy couldn’t just watch this model run on the track that my son-in-law Brad (AKA "Pop") set up for us. Alex kept snatching the cars off as they went by, then he’d run to the controls and flip the switch back and forth when the train stopped moving. “He’s not ready for it,” Brad said, and I had to agree that I could either lose my 25 yr. old model of the Santa Fe or put it back in the closet. Needless to say, Alex returned again and again to the closet, looking for my keepsake. I had difficulty restraining myself from setting the train up again, mostly because I wanted to watch it run! When I was younger, the sound of a freight whistle at midnight conjured up some overwhelmingly lonely feelings, but as I grew older, the rumbling of wheels and long whoos passing through the night began to incite different feelings, feelings of having a companion for my anxieties and nighttime worries – the sounds sorta’ made me feel like The One Whom None Can Hinder and I were on night watch. Long whistles from eastbound freights stimulated ideas, ideas that seemed to be great revelations, but once daylight came, I discarded them because they bordered on fantasies. But midnight trains brought me through some long night watches. I wrote about my longest train ride in Iran in a former blog, but the account was sketchy. I didn’t relate that the Trans-Iranian Railway came into being in 1928, and at the time, the work of building a railway that ran from the Persian Gulf to the Caspian, was a difficult task because the workers met with great technical obstacles in the sector that crossed the Zagros and Elburz Mountains. This engineering feat was not completed until 1938. It was financed by the Iranian government from its monopolies on sugar and tea, and Richard Frye, the guru of Iranian studies, said that the story about the building of this railroad would “occupy a book in itself.” The train that I boarded in Ahwaz, Iran ran sleepily through 226 tunnels and crossed 5496 bridges before I reached Tehran, and in several writings, I described my terror at riding on the roof of the world at 7200 feet, looking down at valleys of bottomless darkness on either side of the narrow tracks. I was comforted only by the aroma of shislik drifting through the darkness of that Friday night and sighed with relief when we reached Qum at dawn. 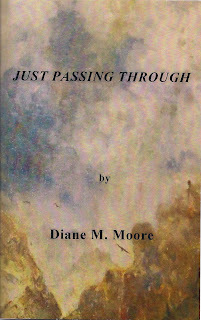 “The Santa Fe Is” appears in my book of poetry, Just Passing Through, published in 2007. The cover is derived from a painting by my brother Paul Marquart. The last table top Christmas village has been put away, and the Norfolk Island pine has joined a sister Norfolk on the patio, still gleaming with the few silver icicles left on its branches. The New Year has settled in with threat of rain. I could almost see Moses’ hand on a bough of the Norfolk pine outside and hear Jesus drawing a deep breath at the condition of the world into which he was born and that hasn’t altered much since his birth. Sunday, I preached a homily that included the thinking of a man called Rauschenbusch in Saving Paradise who identified six kinds of sin that combined to kill Christ: religious bigotry; graft and political power; a corrupt legal system; mob spirit and mob action; militarism; and class contempt and class divisions [not to mention family divisions necessitated by greed]. Same old, same old, as far as I can observe, but it’s strange that these sins are hardly mentioned as faces on the totem pole of sin nowadays. Amen! ‘Seems to me that in this season of “thoughtful solitude,” we’re invited to become more engaged with the people and the life around us…to be useful and to help others get on course in their spiritual lives instead of engaging in the six categories listed above. Note: The above translation of the Rubaiyat was derived from Fitzgerald’s English version in a beautiful book that includes quatrains translated in English, French, and Farsi, which I brought back from Persia in 1975. The miniature was rendered by Hossein, Behzad Miniatur.